Paul Guiragossian was born in Jerusalem in 1926. Following a few generations of artists in his family Paul began to draw at a very early age and along with his brother was sent to the boarding school at the Saint-Jean de Bosco convent in Jerusalem. Everyday life was not easy for the Guiragossians and young Paul worked every summer in order to contribute to the livelihood of his family. Guiragossian continued to draw throughout his youth but kept his passion secret from his mother, who disapproved of him pursuing a career as an artist. Later on when Paul’s mother realized the inevitable persistence and talent of her son she sent him to pursue his earliest artistic studies at Studio Yarkon in Jerusalem. He later settled in Lebanon, in Bourj Hammoud, where he married Juliette Hindian in 1953. The couple had five children: Sylva, Emmanuel, Araxie, Jean-Paul and Manuella, who are all active in the art world today. In 1956, after winning the first prize of Florence in Beirut, Guiragossian received a scholarship to study at the Académie des Beaux-Arts de Florence. A year after that his painting entitled “La Vendeuse de Fleurs” won another first prize and landed him a second scholarship to Paris where he studied and lived in 1961-62. Guiragossian was always interested in themes that reflected the everyday life of the human being and his condition as well as his own life and environment. Starting with self-portraits and portraits of his family, his neighbours, scenes of joy in neighbourhood weddings and births to scenes of tragedy in funerals. He moved to painting couples when he got married; Motherhoods at the birth of his children and to him the mothers were the real heroines in life. Above all, Guiragossian defended the human cause and questioned his identity, coming from an Armenian family who were directly affected by the 1915 Genocide, and migrating from Palestine to Lebanon to live through the Lebanese civil war, Paul’s figures portrayed exile, separation, deportation and then reunions and family. By painting a state of being, the emotions and universal passions. Poverty, which was not foreign to him, is a theme that runs throughout his work. Guiragossian’s paintings are the passionate illustrations of his main concerns, and his desire to reflect the nature of human tragedy. He often used the human body as a vehicle of expression. Along with painting, he also created frescoes, mosaics, stained glass windows and sculpture. From the realism of his beginnings, Guiragossian evolved to a near abstract rendering as his career progressed. His subjects always remained human in form, stylized and minimalized to the point where they sometimes become columns of colour. In 1974, tragedy hit Guiragossian as his leg was amputated following an elevator accident. In a strangely foreboding twist of fate, he sometimes painted scenes where subjects missed a leg. War hit Lebanon in 1975 and the Guiragossians moved to the French capital in the last years of the conflict from 1989 to 1991, at the time of his great retrospective exhibition at the Institut du Monde Arabe de Paris. Guiragossian died suddenly in 1993 in Beirut. He had just completed a painting he considered to be his masterpiece. 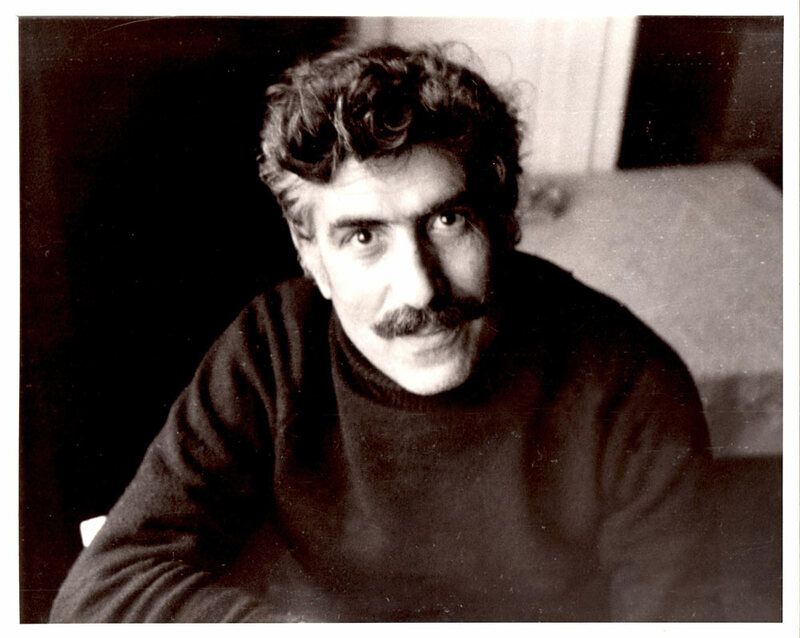 Paul Guiragossian began exhibiting in Lebanon in 1954. He also exhibited collectively and individually in Europe (France, Germany, England and Italy), in the United States, Armenia, Belorussia, and in Arab countries (Egypt, Saudi Arabia, Dubai, Kuwait and Syria). He won numerous prizes, from the Prix de la biennale de Florence in 1956, and the Paris biennale of 1959, the first Prize from the Sursock Museum in Beirut 1968, and from the Lebanese Ministry of National Education in 1970. He was honoured by the German government in 1974 and was made Chevalier de l’Ordre des Arts et des Lettres by France in 1984, made Chevalier de l’Ordre de Saint Sylvestre by Pope Jean-Paul II in1985, and the Ordre de Saint Mesrob Mashdots in 1985. The Lebanese government posthumously attributed him the Cedars Medal of Honour.